In early June, I participated in a live chat with Imagineer Jonathan Ackley about Sorcerers of the Magic Kingdom. 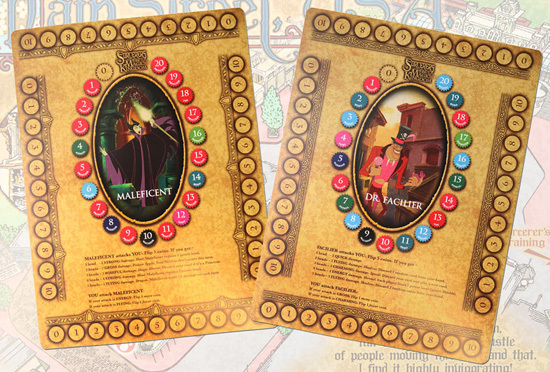 This interactive, role-playing adventure lets apprentice sorcerers help Merlin keep the Disney Villains from taking over the Magic Kingdom. It’s a fun experience that I’ve had a chance to play with my son. 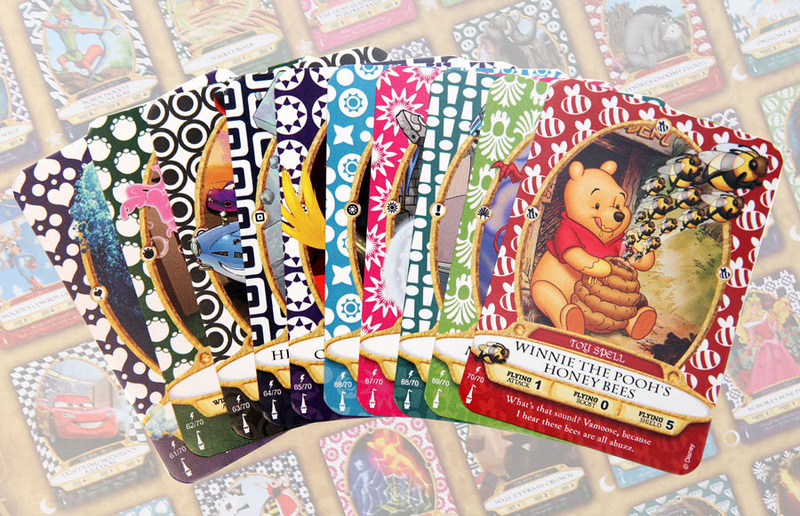 During the live chat, several readers asked about the remaining spell cards – numbers 61 to 70. 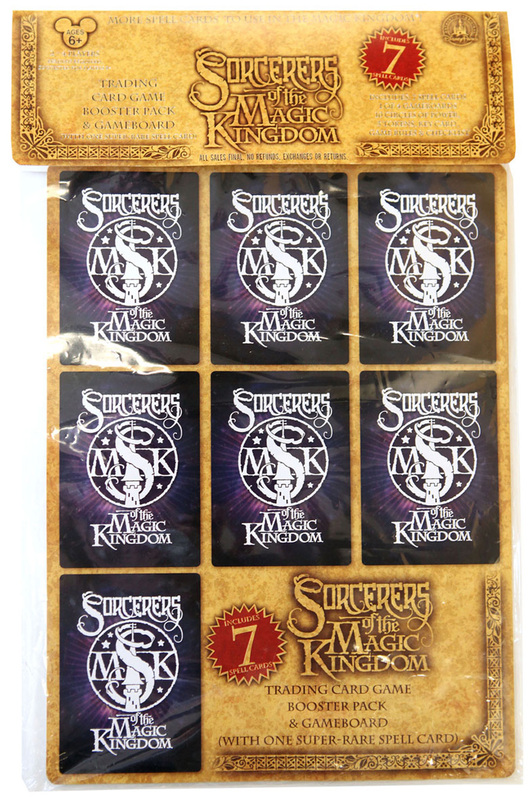 I have good news; Disney Theme Park Merchandise is introducing a new trading card game in August that is based on Sorcerers of the Magic Kingdom. 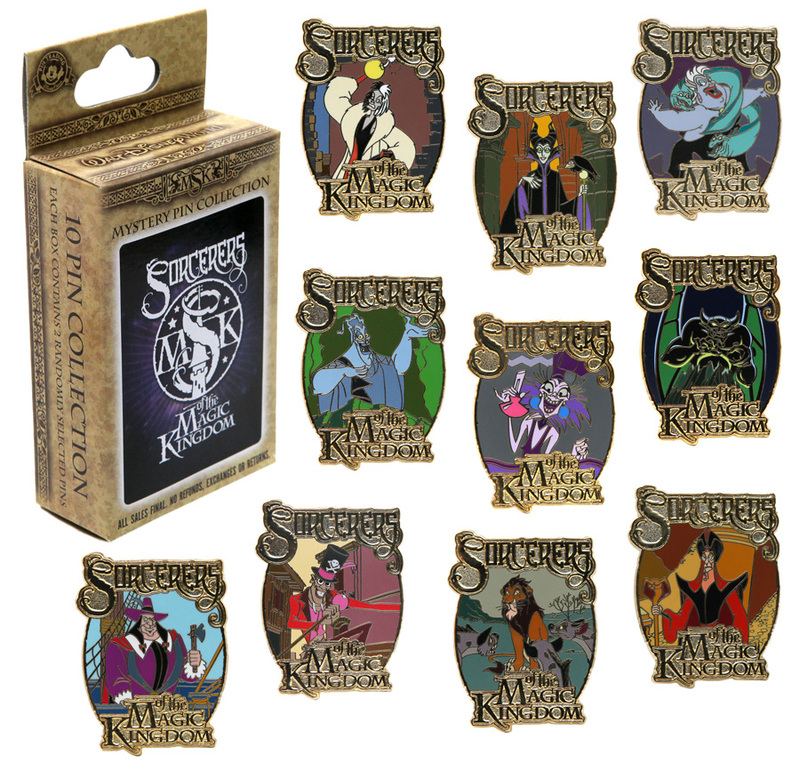 This at-home game includes a way to obtain those super rare spell cards plus a whole bunch more. I spoke with Cody Hampton, Associate Developer for toys and games, about what to expect. The trading card game will contain seven randomly selected spell cards (including at least one super rare spell card), one of four game boards, game rules, new tokens and a complete spell card checklist. I spoke with Disney Design Group Artist Quynh Kimball who worked on the game development. The game will be released at several Walt Disney World Resort locations, and it will be carried via the online Disney Parks Store at a future date. A new mystery pin set is also planned for release later this year. I shared artwork of the set during the live chat. Now, I’m happy to share with you the actual pins from this Disney Villains-themed set – how wonderful to see my favorite villain, Hades! DISNEY CUTS Disney is obviously stenamlinirg its Magical Express program to keep it in line with many airlines current non-carry on no-free baggage policies. If consumers ares not clear in their demand for free space for all items, it’s a sure bet that corporate will start levying fees for additional tags after the first. This is not acceptable. Put DVC on notice that those other tags are wanted then decide or not you need them as you pack when it is a problem. Disney advertising promos need to be more than just extended. With this nation in a deep recession (take a look at the U. S. dollar value worldwide), if course it wants to drum up business and keep cash flowing in. Most people don’t realize that half of projected items come from in park sales of merchandise and food. Perhaps, if Disney cut its ticket prices or extended park hopping as a courtesy it might generate more revenue. Many evenings I would love to dine in Epcot but don’t have the desire to put out extra money for the multiple-park feature so I go instead to local restaurants outside the World. There are a lot of places out there with great selections and bargain prices. Furthermore, with the whole resort complex merchandising so many pricey tee shirts to the exclusion of many items it formerly stocked, I check out nearby discount department stores for my memorabilia. I think companies get back as much as they give, don’t you? I’m surprised that Disney did not implement this strategy and promote the DVC in major cities earlier. After all, the biggest share of DVC owners live in the metropolitan area surrounding New York. Disney is big in NYC right now. Check out and see how many plays it has running. It’s Time Square Disney Store is thriving and it has plans to expand its interests in the area. People on vacation don’t always want to give up time to check out a timeshare which, no matter what Disney chooses to call itself, is exactly what it is. Every American knows just how tight money is. Necessities like food, shelter, clothing, and transportation come before discretionary items like any vacation or even day trip. Of course it has to balance its budget. Of course it has to red line non-essential spending. Nevertheless it must deliver a product that the public perceives is worth putting dollars out for.Personally when it cuts hours I understand BUT I then change my spending to come into line with the changes. One way is by going into parks less frequently, eating meals there, and spending less time and, accordingly, money in the stores. If I spent a day in each park before, I bulk up now and do a couple. After closing, I go outside Disney and eat there. It’s a no-brainer compare McDonald Disney to the greater Orlando area. That is the cheap end. It’s the same relative price comparison as the kind of food service improves. I also stop locally on the way in and figure out what souvenirs if any I’m getting, put that money aside, then get it before going home. That strategy keeps things out of the and helps my wallet too.